It has been a trend in sports nutrition for a couple of years now: supplements that are supposed to improve sleep, and consequently enhance muscle recovery and - you guessed it - muscle growth. 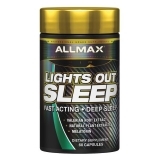 Lights Out Sleep from AllMax is such a supplement. You can see the exact composition below. A component that you find in many of these sleep supplements is Passiflora incarnata. "Through proper sleep we not only facilitate the muscle building process through the protein synthesis, growth hormone and testosterone release that occurs during these hours, but we re-energize and top-up both mentally and physically", we read in an advertisement for Lights Out Sleep. "Consistently achieving 7-9 hours of quality sleep each night could be the single most important way to ensure we are functioning on all cylinders and ready to push some serious weight in the gym." In 2017, Mexican scientists published an animal study in Sleep Science that suggests that supplements with Passiflora incarnata could indeed improve sleep. In that study, the researchers injected a Passiflora extract directly into the small intestine of rats. In the nine hours after administration, the researchers studied the sleep of the animals by measuring electrical activity in their brains. The Mexicans used an alcohol-based extract. If the rats had been people and had taken the extract just orally, they would have consumed 8-12 grams of the extract. The administration of Passiflora incarnata reduced the time that the rats were awake. The extract had no effect on the REM sleep of the rats, but did increase their slow wave sleep. Whether you look at hormonal regulation, the immune system or neurological processes, the slow wave sleep is the most important part of sleep for biological recovery. "The obtained results suggest that Passiflora incarnata contains components that facilitate the presence of the slow wave sleep and inhibit that of REM sleep", write the Mexicans. "Additional experiments should be carried out in order to isolate the active principles and evaluate their effects on each sleep phase." "Shortening of sleep latency and increasing the amount of slow wave sleep by the extracts of Passiflora incarnata suggest that this plant possesses adequate properties to be considered as sleep inducer." What works in animals does not always work in humans. This, plus the high dosages the Mexicans used, justifies the question whether Passiflora is useful for people who want to improve their sleep have something. The answer to that question may well be 'yes'. There are human studies on the effect of Passiflora incarnata on sleep. For example, in 2011 a study was published in which healthy people aged 18-35 drank a cup of Passiflora tea every evening for a week. The subjects made each cup from 2 grams of dried Passiflora. [Phytother Res. 2011 Aug;25(8):1153-9.] A control group received tea without sleep-inducing substances. At the end of the week, the subjects who had received Passiflora incarnata felt more refreshed during the day than the placebo group. Moreover, they gave the quality of their sleep a higher score than the placebo group. The scores below go from 0 [worst score] to 5 [best possible score]. The results of this study are interesting for women with an estradiol-sensitive breast cancer variant, but also for pharmacological athletes. When children take 600 milligrams of DHA from algae every day, they sleep for 45 minutes longer.